On February 10, 2008, three armed men wearing ski masks walked into the E.G. Buehrle Collection in Zurich, Switzerland. While one of them held staff and visitors at gunpoint, the other two helped themselves to four Impressionist masterpieces: Claude Monet’s Poppies near Vetheuil, Edgar Degas’ Count Lepic and his Daughters, Vincent Van Gogh’s Blossoming Chestnut Branches and Paul Cezanne’s The Boy in the Red Vest. It was one of the largest heists in Europe in terms of market value. The four paintings were worth an estimated $163.2 million. Converting famous paintings into quick cash is rarely as easy as thieves imagine, however. The Van Gogh and Monet were found a week later in a car parked outside a Zurich psychiatric hospital. The remaining two disappeared without a trace. Witnesses at the Zurich museum testified that the thieves spoke German with Slav accents. Two years ago, Serbia’s Anti-Organized Crime Unit, in collaboration with the police of several other European countries, opened an investigation into the theft. 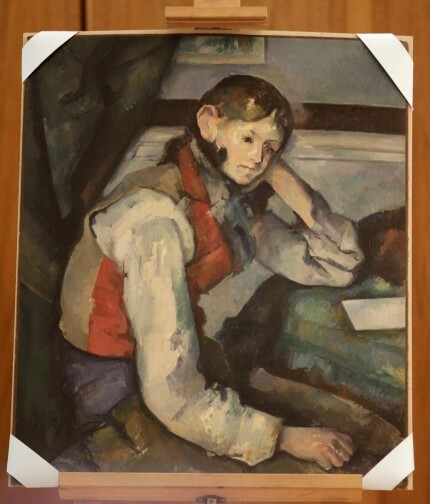 They uncovered a plan by four men to sell the Cezanne to a Serbian buyer for three million euros (about $4 million). The plan was thwarted when ringleader Ivan Pekovic was cornered in a parking lot after a high-speed chase through the streets of Belgrade. The Cezanne was found in his car along with a cache of firearms and more than £1 million ($1.6 million) in cash. Police arrested two other men thought to be part of the ring, one in Belgrade and one in the southern town of Cacek. 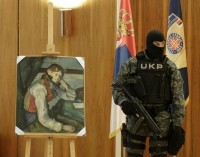 A museum curator quoted by Serbia’s Blic newspaper said criminals smuggle artwork stolen in Western Europe through Serbia and on to Montenegro where they are then sold for cash to members of the Russian oligarchs eager to get their hands on a masterpiece. 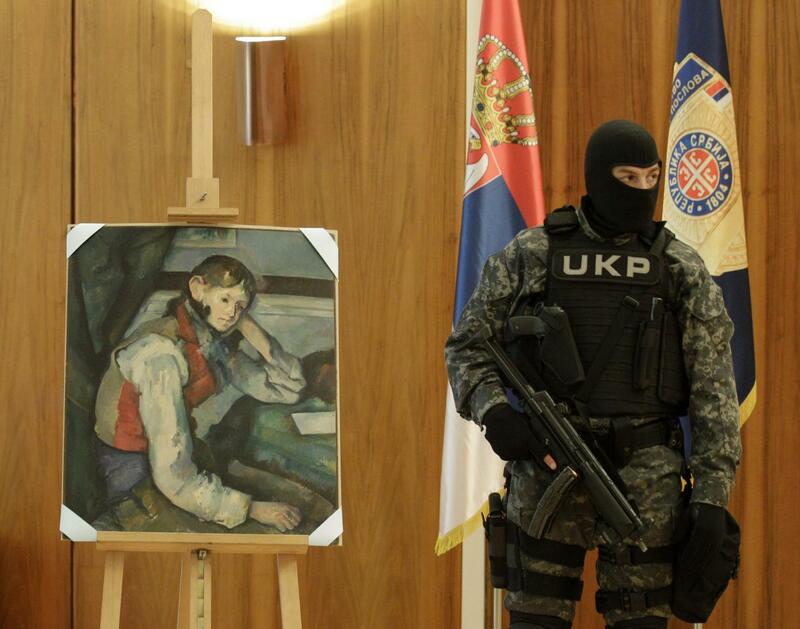 Another network takes stolen art to Kosovo where thieves sell it to rich Albanians. The recovered painting has been authenticated by a Swiss expert. It is indeed the missing Boy in the Red Vest, one of four slightly differing versions made by the Impressionist master. The other three are in museums in the United States. That leaves only the Degas still to be found. According to this BBC article, Serbian interior minister Ivica Dacic said that the Degas had been found in 2009, but I’ve searched high and low and I can’t find anything about this in the 2009 press. You’d think it would have made just as much of a splash as the recovery of the other three have made.